There's a common need that transcends an organization's industry, size and IT requirements: the need to print. That's as true for companies providing financial and legal services as it is for those that operate in the agricultural sector. And with the need to print comes the need for an efficient, reliable print environment that is hardy enough to handle the toughest printing demands day after day while being flexible enough to accommodate future change. That's why so many organizations that are looking for a better print management solution turn to PrinterLogic. The independent research firm TechValidate was curious to see whether PrinterLogic was meeting the expectations of one medium-enterprise agriculture company and the challenges of its print environment, so it recently produced a case study (TVID: 7DC-F71-277) about the experience. This company had fewer than 250 network printers, but these devices were spread across 13 sites. That made centralized administration and user self-service—PrinterLogic’s forte—all the more important. It took only one day for this medium-enterprise agriculture company to fully install PrinterLogic throughout the entire organization. After just twelve months, the savings associated with PrinterLogic had paid for the cost of its implementation, and the return on investment (ROI) since then has far exceeded 100%. 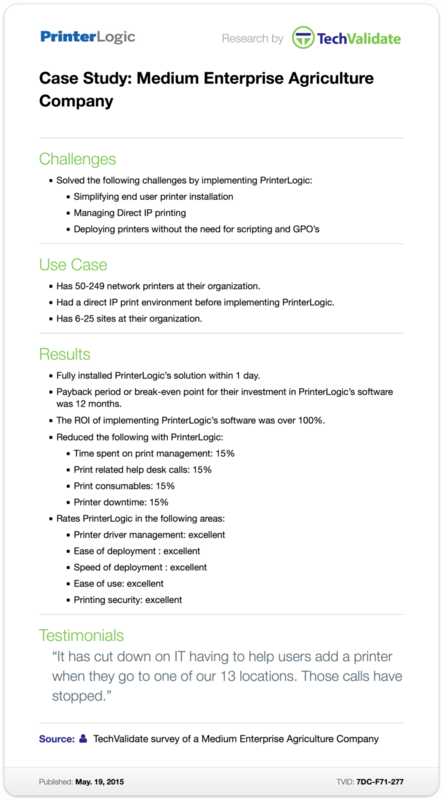 Results like these indicate one thing: Regardless of your organization's size or sector, if you have a need to print, you have a need for PrinterLogic’s cost- and resource-saving print management.